PVMBG noted that due to visual and instrumental monitoring results as well as level of potential hazards the Alert Level for Kelut was lowered to 1 (on a scale of 1-4) on 12 August. Residents and visitors were advised to not approach the crater rim, crater floor, or the rivers that disgorge from Kelut. Synopsis. 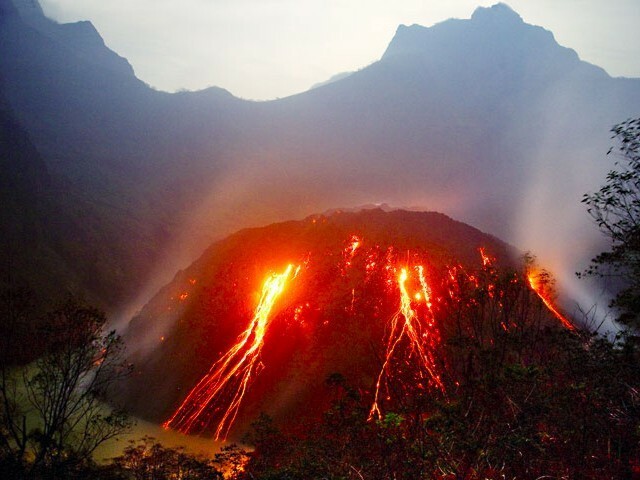 On 13 February 2014, the Indonesian National Board for Disaster Management (Badan Nasional Penanggulangan Bencana-BNPB) reported that a major eruption occurred at Kelut (also known as Kelud) volcano in East Java, Indonesia. Ground-based observers had little insight about the ash plume height, but a number of satellite observations helped to constrain the height and other eruption parameters such the direction of plume movement. CALIPSO satellite data revealed that a rapidly rising portion of the plume ejected material up to an altitude exceeding ~26 km, well into the tropical stratosphere. Most of the less rapidly rising portions of the plume remained lower, at 19-20 km altitude. The 2014 eruption destroyed a dome emplaced in the volcano's caldera during the previous eruption in 2007 (BGVN 33:03 and 33:07). According to BNPB in a report issued on 18 February 2014, ~7 people were killed and ~100,000 evacuated. At least one commercial aircraft flew into the plume, later landing successfully but incurring costly engine damage. This report discusses the pre- and syn-eruption observations from the early January through 25 February 2014. Much of the detailed reporting used here describing Kelut's behavior came from the Indonesian Centre for Volcanology and Geological Hazard Mitigation (CVGHM; also known as Pusat Vulkanologi dan Mitigasi Bencana Geologi, PVMBG). Kelut is located just S of Surabaya (Surabaja), Indonesia's second largest city (see a map, figure 8 in BGVN 33:03). Pre-eruption. According to CVGHM, the lake-water temperature in the crater increased 5.5°C during 10 September 2013 to 2 February 2014. During 1 January-2 February 2014 the number of shallow volcanic earthquakes at Kelut volcano increased. During 3-10 February 2014, seismic activity at Kelut was dominated by both shallow and deep volcanic earthquakes; some hypocenters were 3 km below the summit. Real-time Seismic-Amplitude Measurement (RSAM, a gauge of volcanic seismicity) values increased on 6 and 9 February 2014. Inflation was detected at one station. Peaks of pre-eruptive seismicity occurred during 15-16 and 28 January, and 2-13 February. Table 3 also portrays the available early 2014 seismic data from CVGHM, but it can be hard to see the aforementioned detail because the various entries on table's rows generally summarize multiple days and some of the time intervals differ. The number of deep volcanic earthquakes fluctuated but generally increased overall. Earthquakes often occurred at 2-8 km depth. Based on these observations, on 2 February the Alert Level was raised to from 1 to 2 (on a scale with increasing severity in the range 1-4). Tiltmeter data on 10 February indicated inflation. Table 3. Seismicity at Kelut volcano during January and into 13 February 2014. Note that the data stream changed abruptly on 13 February when four of Kelut's 5 seismic stations were destroyed by eruptive material. Courtesy of CVGHM. Crater lake water temperatures continued to increase after September 2013, particularly during 23 January-9 February. Temperatures decreased slightly when measured on 10 February. On 10 February, based on the factors noted above, CVGHM increased the Alert Level to 3. This excluded visitors and residents from within a 5-km radius of the crater. Eruption on 13 February. At 2115 on 13 February the Alert Level for Kelut was raised to 4, extending the exclusionary zone to a 10-km radius. As noted above, BNPB reported that a major eruption occurred less than two hours later at 2250, followed by another large explosion at 2330. NASA reported that satellite images showed the Kelut eruption about 2 hours later on 13 February 2014 at ~2315 local time (1615 UTC). According to a Darwin VAAC (2014) weekly activity report, the eruption was seen on the hourly MTSAT-2 IR satellite for 1632 UTC (2332 local time) on 13 February, where it appeared as a rapidly expanding cloud. More details came from 10-minute IR data being used on a special basis in the High Ice Project in Darwin, which captured the eruption clearly as a small cluster of cold pixels on a 1610 UTC (2310 local time) IR image. Later analysis found a small low altitude plume as early as 1540 UTC (2240 local time) at Kelut on the MTSAT-1R satellite; this is the earliest reported start time for the eruption. According to CVGHM, ash plumes rose to an altitude of 17 km and caused ashfall in areas NE, NW, W, and elsewhere as far as Pacitan (133 km WSW), Kulon Progo (236 km W), Temanggung (240 km WNW), and Banyuwangi (228 km E). As ash began to blanket parts of the region, 40 airline flights were cancelled; impacted airports included Juanda (81 km NE), Adi Sucipto Yogya (208 km W), and Adi Sumarmo Solo (175 km WNW). News articles reported that flights in and out of seven airports were cancelled or rerouted. Figures 15 and 16 show satellite images of the plume taken on 13 February 2014. The image at the top of figure 15 portrays the scene at 0030 local time and the trace of the path across it taken by the satellite. At ~1813 UTC on 13 February. CALIPSO (Cloud-Aerosol Lidar and Infrared Pathfinder Satellite Observation). CALIPSO flew over the plume deploying CALIOP (a lidar instrument, essentially a laser range finder that creates a profile of clouds and particles in the atmosphere). This is one of the favored instruments for cloud height measurement. It is part of the A-Train, a constellation of multiple satellites and instruments that follow the same track on polar orbits and cross the equator within seconds to minutes of each other. This allows near-simultaneous observations. CALIOP data revealed that the Kelut ash cloud was generally at an altitude of 18-19 km, with some cloud/ash material reaching a maximum height of ~26 km. This is sufficiently high, and the A-Train data capabilities are sufficiently large to cause great interest, and more refined estimates of height and other parameters are likely to follow. Figure 15. Figure 15 (top and bottom). At 0030 local time (1730 UTC 13 February) on 14 February, the Visible Infrared Imaging Radiometer Suite (VIIRS) on the Suomi NPP satellite acquired the top image as the gray circular ash plume over Kelut reached above a lighter-colored weather-cloud deck. Forty minutes later, at 0110 local time (1810 UTC 13 February), the Cloud-Aerosol Lidar and Infrared Pathfinder Satellite Observation (CALIPSO) satellite flew over the plume with its lidar instrument. The instrument recorded the ash cloud at nearly 20 km altitude, with sections of the plume reaching to nearly 26 km. Courtesy of NASA Earth Observatory; image by Jesse Allen, using data provided by the CALIPSO team; caption by Holli Riebeek. Figure 16. A cross-section through the Kelut volcanic plume from data acquired on 14 February 2014. The image zooms in on CALIPSO data for the tallest parts of the volcanic cloud (using the CALIOP data). The white line shows the approximate troposphere-stratosphere boundary. Some wave structure (small white oscillations) is apparent in the umbrella region. The vertical scale on the left shows computed altitude, and on the lower right shows the color scale for intensity of the 532 nm wavelength backscatter. The horizontal scale and labels at the bottom of the figure shows the latitude, longitude, and time in UTC for the vertical sounding across the transect. The red trace across the bottom of the figure shows land topography, with the volcano at the center. The AIRS (atmospheric infrared sounder) determined SO2 brightness temperature differences (BTD-scale at upper right) referring to features such as the red stars, where AIRS detected SO2 towards the edge of the cloud. Courtesy of Carn and Telling (2014). Figure 17 shows a view of an eruption at 0030 local time on 14 February. In Figure 18, a plane, service vehicle, and boarding area are shown covered by ash at Yogyakarta airport, 215 km E of Kelut. Closer to the volcano, ashfall and tephra blocks 5-8 cm in diameter caused structures to collapse, including schools, homes, and businesses. Figure 17. A photo of the eruption of Kelut at 0030 on 14 February 2014, with lightning being generated in the ash plume. Courtesy of Volcano Discovery web site (URL: http:pic.twitter.com/ypy7kx9615 / @hilmi_dzi). Figure 18. Image of a tan-colored ash blanket covering the landscape, including a parked jet liner and service vehicle, at Yogyakarta airport, 215 km W of Kelut, taken 14 February 2014. Image from NBC News web site (BIMO SATRIO / EPA). As a result of this eruption, four of the five Kelut seismic stations were destroyed, after which, volcanic and low-frequency earthquakes were not recorded. Subsequently, available seismicity recorded at the one remaining station, 5 km away, was dominated by continuous tremor with amplitudes ranging from 0.5 to 15 mm. That station later recorded declining seismicity during 14-20 February. Two more seismic stations were installed on 16 February, 2-3 km from the crater. On 14 February, gray-to-black plumes rose 400-600 m above the crater, and on 15 February grayish white plumes rose as high as 3 km (figure 19). Figure 19. The eruption of Kelut (labeled just to the right of the image's center) on 13 February 2014 sent a large plume of ash drifting W across Java and over the Indian Ocean. This satellite image, acquired 14 February, shows widespread tan atmospheric discoloration from the ash plume. According to an advisory issued by the Australian Bureau of Meteorology, ash had reached 13 km in altitude, prompting the closure of several airports. Three people were killed, and Indonesian authorities have evacuated more than 75,000 people from their homes. NASA Earth Observatory, image by Jesse Allen and caption by Adam Voiland, using data from the Land Atmosphere Near real-time Capability for EOS (LANCE). On 14 February BNPB reported that the eruption had killed four people (but later estimates were higher): one died due to a collapsing wall, one from ash inhalation, and two from "shortness of breath." All four victims lived within 7 km of Kelut in the regency of Malang, an area that received ashfall up to 20 cm thick. By 0600 on 14 February, BNPB reported that the number of displaced people reached 100,248, but the report also noted that volcanic activity had declined. Later that day BNPB noted that 76,388 people remained evacuated. Seismicity continued to decline and was at moderate levels during 15-17 February. During 16-20 February white plumes rose as high as 1 km and drifted N, NE, and E.
Heavy rain on 18 February caused lahars in Ngobo, Mangli (Kediri, 35 km WNW), Bladak (Blitar, 20 km SW), and Konto (Malang, 35 km E). BNPB noted that the lahars flooded five houses and one mosque, and destroyed two homes and one bridge. An 18 February BNPB report noted that a total of 7 people in Malang regency had died, and that the ashfall had affected farms, including cattle health and dairy production, and the water supply. Damage to infrastructure in Malang included 3,782 houses, 20 government buildings, 251 schools, 9 hospitals, and 36 churches. Data from satellite instruments provided a 14 February 2014 image on sulfur dioxide (SO2) from Kelut (figure 20). The plume had spread primarily W of the volcano. Figure 20. Sulfur dioxide burdens measured from Kelut (red triangle) over the Indonesian island of Java and Indian Ocean in the early morning of 14 February 2014 following the Kelut eruption. This image is based on data from the IASI instrument on the MetOp mission. Courtesy of European Space Agency (2014). The Alert Level for Kelut was lowered by CVGHM from 4 to 3 on 20 February and to 2 on 28 February based on decreased amplitude of tremors and thick clouds of white smoke continuously emitted from the crater instead of dark grey. At this point, visitors and residents were prohibited from approaching the crater within a radius of 5 km, but residents outside of this zone were permitted to return home. Associated with the Kelut eruption, only a single pixel MODVOLC satellite thermal alert was measured during the interval from 13 February through March 2014. The alert occurred at 1515 hours UTC on 20 February 2014, the first alert measured since nearly daily alerts from Kelut's last eruption, 18 November 2007-23 January 2008. During the February 2014 eruption, cloudy weather over Kelut was a major factor that precluded some alerts from being measured, but those visualized suggest that the recent Kelut eruption continued until at least 20 February 2014. A satellite image made available thanks to the International Charter Space and Major Disasters (2014) was acquired on 18 February and interpreted by the U.S. Geological Survey. The image reveals the impact of the eruption on the summit area and regions peripheral to it (figure 21). Figure 21. Satellite image of the crater area of Kelud, acquired on 18 February 2014. The former dome was destroyed during the 14 February eruption and significant ash and debris were deposited on the volcano slopes and in the river channels from lahars and pyroclastic flows around the volcano. Steam can be seen rising from the central crater. Courtesy of International Charter Space and Major Disasters (2014); source was WorldView, acquired 18/02/2014 by DigitalGlobe Inc.; map produced by USGS, and found online at Klemetti (2014c). Later visits disclosed that the 2014 eruption had left a large crater 400 m in diameter and destroyed the 2007 dome, parking area, and access stairs in the crater (see figures 22 and 23). Figure 22. Photograph of the inner dome in Kelut volcano taken in 2010, showing the then- existing lava dome from the 2007 eruption and the access stairs to the crater, both of which were destroyed by the February 2014 eruption. Image courtesy of Zahidayat / Flickr, from Klemetti (2014b). Figure 23. (Left) The Kelut lava dome that grew in the crater in 2007, photographed 30 October 2011 by Andersen (2011). In front of the dome was the small portion of what was left of the volcanic lake that used to fill the crater. (Right) The crater of Kelut seen on the morning of 18 February 2014 (photo by Suwarno, a local photographer, via Andersen), showing that the 2014 eruption forcefully removed the dome. Comparison figure came from Andersen (2014). A group of photographs taken by Oystein Lund Andersen (2014) during a visit from 22 to 23 February show after-eruption images, including steam rising from the crater area, ash and volcanic bombs deposited 2-5 km from Kelut's crater, and damage to trees and other vegetation by pyroclastic flows (for example, Figures 24 and 25). In addition, photographs showed that steam continued to rise from the crater through 25 February 2014. Andersen observed that activity at the volcano has decreased, but it was still unknown what exactly the situation at the vent is, whether or not a new lava dome is forming there. Figure 24. Steaming pyroclastic flow deposits in one of the valleys below the crater, a once forested area ~1 km SW of the crater .Photo taken at 1157 on 22 February 2014. Courtesy of Andersen (2014). Figure 25. A lush green forest once stood here, now covered by deposits from a pyroclastic flow and scattered remains of large felled trees. Photo taken at 1205 on 22 February 2014. Courtesy of Andersen (2014). Airliner encounters plume. A commercial A320 airliner carrying passengers from Perth, Australia, to Jakarta, Indonesia, encountered an ash plume from Kelut near Indonesia on 14 February 2014. The incident was reported by the West Australian (Perth) newspaper and the Sydney Morning Herald (14 February). The reports noted that the airliner left Perth on 14 February 2014 at 0225 local time and flew through the ash cloud before arriving safely in Jakarta at 0550 local time. The estimated cost to replace the two engines of the Airbus aircraft was reported to be $20 million (US dollars). The A320 was grounded after the flight. Morning Herald reporter Amanda Hoh (2014) reported that a "flight from Perth to Jakarta on Friday morning was filled with smoke after the plane flew into Indonesia's volcanic ash cloud … Richard Craig, from Perth, was on a flight to Jakarta at about 5am on Friday [14 February] when he said the plane suddenly flew into the ash cloud about 30 minutes before landing" Passenger Craig was quoted to have said "It was just starting to get light then it suddenly went quite dark and what I thought was smoke appeared in the cabin out the front, started coming out of the air vent and alarm went off and beeped a few times," he said. "There was an unusual smell. It wasn't like smoke, a slightly sweet smell. More like a very fine smoke…" The smoke cleared within a few minutes and Craig noted that the pilot announced that "it was a volcanic ash cloud and that 'no one was aware of it in the area.'" The plane landed safely. Summary of damage. According to the International Federation of Red Cross and Red Crescent Societies (IFRC) (2014), "over the first few days the eruption affected 201,228 people (58,341 families) from 35 villages in three districts: Blitar, Kediri, and Malang. . . As of 14 February 2014, there had been seven fatalities and 70 people in hospitals in serious condition suffering from ash inhalation. Around this time the number of internally displaced persons (IDPs) had reduced to 100,248 people who had evacuated and camped across the province in 172 IDP camps set up to cater for their basic needs." "In addition to the volcanic ash, heavy rain fell and produced cold lahar flooding in Malang, Kediri and Blitar districts. This caused further damage to buildings, farm lands, and roads." Table 4 gives data on damage to structures in the 3 affected districts surrounding Kelut through February 2014. The figures are expected to increase once a more thorough assessment is made. Table 4. An initial assessment of the damage to housing and other buildings as a result of Kelut eruption volcanic ash. Courtesy of IFRC (2014). As reported on 24 February 2014 in the Jakarta Globe (Pitaloka, 2014), "torrential rain in East Java on 23 February 2014 prompted local officials to impose a safety curfew over some areas affected by the eruption of Mount Kelud for fear that rainwater could mix with volcanic dust, triggering mud flows." The Head of the Malang Disaster Mitigation Agency, Hafi Lutfi, said rain had triggered landslides that damaged several sections of mountain road. "A mud flow in Padansari village on Thursday [13 February] washed away two houses and two bridges, although no casualties were reported . . . Volcanic mud was carried down the mountain's slopes by the river, which flows through Kasembon, Ngantang and Pujon subdistricts" (figure 26). Figure 26. Villagers stand on the remains of a bridge washed out in Malang district near Pandansari village. The bridge succumbed to water mixed with volcanic material from Mount Kelut's eruption on 19 February 2014. From Pitaloka (2014); EPA photo by Fully Handoko. Lutfi was reported to have stated further that the "impact of Mount Kelud's eruption will extend far beyond the initial cleanup efforts. Fruit farmers reportedly lost more than Rp 24 billion ($2 million) in revenue as ash and debris destroyed whole fields of apples, durian and rambutan that were ready for harvest. The trees, covered in a thick coating of ash, had withered from lack of sunlight." Background. The CVGHM reported that activity at Kelut last occurred in 2007, beginning with an increase in seismic activity and an eruption in October 2007. The activity ended with an effusive eruption on 3-4 November 2007 resulting with a crater lake surrounding a central lava dome (BGVN 33:03, 33:07, and 37:03). Andersen, O.L., 2011 (30 October), Mt. Kelud Volcano, Indonesia, 30 October 2011(URL: http://www.oysteinlundandersen.com/Volcanoes/Kelud/Kelud-Volcano-Indonesia-October-2011.html). CIMSS Satellite Blog, 2014 (13 February), Eruption of the Kelut volcano in Java, Indonesia (URL: http://cimss.ssec.wisc.edu/goes/blog/archives/14910 ). European Space Agency (ESA), 2014 (14 February), Kelut volcano grounds air travel, ESA Observing the Earth web site (URL: http://www.esa.int/Our_Activities/Observing_the_Earth/Kelut_volcano_grounds_air_travel). International Federation of Red Cross and Red Crescent Societies, 2014 (3 March), Emergency plans of action (EPofA), Indonesia: Volcanic eruption - Mt. Kelud (URL: http://reliefweb.int/sites/reliefweb.int/files/resources/MDRID009dref.pdf). Klemetti, E., 2014b (13 February), Significant Eruption Started at Indonesia's Kelut (URL: http://www.wired.com/wiredscience/2014/02/significant-eruption-started-indonesias-kelut/). Klemetti, E., 2014c (24 February), Kelud, Before and After the Eruption (URL: http://www.wired.com/wiredscience/2014/02/kelud-eruption/). Pitaloka, D.A., 2014 (24 February), Torrential Rain Worsens Kelud Misery, Jakarta Globe (URL: http://www.thejakartaglobe.com/news/torrential-rain-worsens-kelud-misery). Volcano Discovery, 2014 (2 March), Kelut volcano news (URL: http://www.volcanodiscovery.Kelut volcano news & eruption updates _ 27 Sep 2007 - 2 Mar 2014.htm). Information Contacts: Indonesian Centre for Volcanology and Geological Hazard Mitigation – CVGHM (also known as Pusat Vulkanologi dan Mitigasi Bencana Geologi (PVMBG)), Jalan Diponegoro 57, Bandung 40122, Indonesia (URL: http://www.vsi.esdm.go.id/); Darwin Volcanic Ash Advisory Centre (VAAC), Australian Bureau of Meteorology, Northern Territory Regional Office, PO Box 40050, Casuarina NT 0811, Australia (URL: http://www.bom.gov.au/info/vaac); MODVOLC, Hawai'i Institute of Geophysics and Planetology (HIGP) Thermal Alerts System, School of Ocean and Earth Science and Technology (SOEST), Univ. of Hawai'i, 2525 Correa Road, Honolulu, HI 96822, USA (URL: http://modis.higp.hawaii.edu/); Badan Nasional Penanggulangan Bencana (BNPB – Indonesian National Board for Disaster Management), Jl. Ir.H.Juanda No. 36 Jakarta Pusat, Indonesia (URL: http://www.bnpb.go.id); CIMSS (NOAA's Cooperative Institute for Meteorological Satellite Studies), University of Wisconsin – Madison's Space Science and Engineering Center (SSEC) (URL: http://cimss.ssec.wisc.edu/goes/blog/about); NOAA Satellite and Information Service, Automated OMI SO2 Alert System, High SO2 Concentration Areas (URL: http://satepsanone.nesdis.noaa.gov/pub/OMI/OMISO2/Alert/alert.html); National Aeronautics and Space Administration (NASA) Goddard Space Flight Center (URL: http://so2.gsfc.nasa.gov); European Space Agency (URL: http://www.esa.int); West Australian (Perth) news (URL: http://au.news.yahoo.com/a/21467336/); Sydney Morning Herald (URL: http://www.smh.com.au); Andersen, Oystein Lund (URL: http://www.oysteinlundandersen.com/); IAVCEI Remote Sensing Commission website (URL: https://sites.google.com/site/iavceirscweb/eruptions/kelut-2014); and Simon Carn, Department of Geological and Mining Engineering and Sciences, Michigan Technical University, Houghton, MI. PVMBG noted that the Alert Level for Kelut was lowered to 2 (on a scale of 1-4) on 28 February. PVMBG reported that on 14 February, the day after a large eruption at Kelut that began at 2250 on 13 February, gray-to-black plumes rose 400-600 m above the crater. On 15 February grayish white plumes rose as high as 3 km. During 16-20 February white plumes rose as high as 1 km and drifted N, NE, and E. Heavy rain on 18 February caused lahars in Ngobo, Mangli (Kediri, 35 km WNW), Bladak (Blitar, 20 km SW), and Konto (Malang, 35 km E). BNPB noted that the lahars flooded five houses and one mosque, and destroyed two homes and one bridge. The report noted that four out of the five seismic stations monitoring Kelut were destroyed during the eruption. The one remaining station, 5 km away, recorded declining seismicity during 14-20 February. Two more seismic stations were installed, 2-3 km from the crater, on 16 February. The Alert Level was lowered to 3 on 20 February. Visitors and residents were prohibited from approaching the crater within a radius of 5 km; residents outside of the 5-km restricted zone were permitted to return home. PVMBG reported that during 1 January-2 February the number of shallow volcanic earthquakes at Kelut increased, with peaks of seismicity occurring during 15-16 January, 28 January, and 2 February. The number of volcanic earthquakes also fluctuated but increased overall. Earthquakes occurred 2-8 km below Kelut. The temperature in the crater lake increased 5.5 degrees Celsius since 10 September 2013. On 2 February the Alert Level was raised to 2 (on a scale of 1-4). On 9 June, CVGHM reported that the Alert Level for Kelut was lowered to 1 (on a scale of 1-4). No changes had been seen; occasional diffuse white plumes rose 50-150 above the crater. CVGHM recommended that people not approach the lava dome due to instability of the area and the presence of potentially high temperatures and poisonous gases. CVGHM reported that on 29 November, the Alert level for Kelut was lowered from 3 to 2 (on a scale of 1-4), due to a decrease in seismicity and a lack of deformation. Observations of video footage from a camera on 25 November revealed that the lava dome was still active. Visitors and tourists were advised not to go within a 1.5-km radius of the crater lake. CVGHM reported that on 6 November, temperatures at the surface of Kelut's crater lake measured 75 degrees Celsius and the newly exposed lava dome surface measured 150-210 degrees Celsius. Plumes inhibited clear views of the lava dome. CVGHM lowered the Alert Status of Kelut on 8 November from 4 to 3 (on a scale of 1-4), due to a decrease in seismicity and stability indicated by deformation-monitoring instruments. CVGHM recommended that evacuees could return to their homes, but activity within a 3-km radius was restricted. According on a news article, a volcanologist reported that the lava dome was 250 m in diameter and 120 m above the crater lake surface. On 11 November, a plume rose to an altitude of 3.7 km (12,000 ft) a.s.l. and ashfall was reported in several areas. CVGHM reported that a series of earthquakes from Kelut during 24-31 October were dominated by shallow events and tremor. Seismicity intensified during 2-3 November, and then decreased on 4 November. On 2 November the temperature of the crater lake was 50 degrees Celsius, the highest temperature recorded. On 4 November, white plumes rose to an altitude of 2 km (6,600 ft) a.s.l. and drifted N. Observations of video footage from a closed-circuit television camera revealed that a black mass protruded from the lake and was likely the cause of the plumes. The Alert Level remained at 4 (on a scale of 1-4). CVGHM reported that the Alert Level for Kelut remained at 4 (on a scale of 1-4) during 17-23 October. According to news articles, several thousand evacuated people remained in shelters. CVGHM reported that the Alert Status of Kelut was raised on 16 October from 3 to 4 (on a scale of 1-4). During 15-28 September, gas discharge from the crater lake increased and spread in a radius of 5 m. Inflation around the summit occurred during 13-16 October. On 16 October, the temperature in the crater lake increased to 37.8 degrees C.
According to news articles, carbon dioxide and other gases emitted from Kelut reached 7 times normal levels. Increased seismicity and gas emissions prompted people from villages near the summit to self-evacuate. Villagers and tourists were advised not go within a 5 km radius of the active crater. CVGHM reported that the Alert Status of Kelut was raised on 29 September from 2 to 3 (on a scale of 1-4) based on observations, increased seismic activity, deformation measurements, and changes of crater lake water chemistry and temperature. Villagers and tourists were advised not go within a 5 km radius of the active crater. CVGHM reported that the Alert Status of Kelut was raised on 11 September from 1 to 2 (on a scale of 1-4). According to a news report, the water in the crater lake increased in temperature and changed color from the usual green to yellow. Villagers and tourists were advised not go within a 5 km radius of the active crater. VSI reported that there were no major changes in volcanic activity at Kelut during 2-9 April. The temperature of the water in the crater lake decreased slightly. On 2 April the lake was at 48.5°C and on 9 April it was at 48°C. The volcano remained at Alert Level 2 (on a scale of 1-4). In the wake of earlier concern about renewed volcanic activity at Kelut, the VSI reported that during 12-17 February the temperature of Kelut's crater lake decreased and its pH increased. The temperature decreased to 47.5°C from a range of 50.1 °C to 51 °C, measured during 29 January to 7 February. The pH of the water increased to 5.3 from 5, measured on 7 February. The volcano remained at Alert Level 2 (on a scale of 1-4). VSI scientists found that the temperature of Kelut's crater lake had increased and its pH dropped as follows. During 29 January to 7 February the lake's temperature ranged from 50.1 °C to 51 °C, compared with 47.5 °C on 18 January and 38.5 °C on 8 January. On 7 February the pH of the water was 5, compared with measurements of 6.3 in January 2001 and 6.9 in November 2000. The volcano remained at Alert Level 2 (ranging from 1-4). The VSI reported that activity remained normal during 23-29 January. There were no major changes since the previous week when the Alert Level was raised from level 1 to 2 on 19 January after several monitored parameters changed at the volcano. Kelut remained at Alert Level 2 (on a scale of 1-4). On 19 January the VSI raised the Alert Level at Kelut from 1 to 2 (on a scale of 1-4). The temperature of the crater lake increased, the volcano inflated 5.5-6 mm, and a 5 cm increase in crater lake water level took place on 21 January. A strong explosive eruption on 10 February produced a large cloud and heavy tephra falls. Although evacuation began before the onset of the eruption, more than 30 people were reported killed in the densely populated area near the volcano. Local seismicity increased to ~10x the normal rate between the middle and end of November, then returned to background levels. A second episode of increased seismicity occurred during the second and third weeks of January, accompanied by a rise in crater lake temperature from 32 to 38°C. Enhanced earthquake activity was again detected 7 February, and lake temperature peaked at 39-41°C. Measurements on 8 February indicated that lake pH had decreased to 4.2 from its usual 4.9, and hydrophones in the lake recorded noise at 3x normal levels. However, seismicity and hydrophone noise declined that day and remained relatively quiet until the onset of the eruption. During the night of 9-10 February, transmission from the lake instruments (via the ARGOS satellite) ceased. VSI issued an evacuation warning on 10 February at 1000. Press sources estimated the number of evacuees at 60,000. The eruption began 10 February at 1141, with the strongest explosive phase at 1250, and activity continued until 1700. Pyroclastic flows traveled [5-6] km down the steep-walled valley on the E flank (from the breach in the summit crater), filling it to a depth of ~10 m. The crater lake was emptied during the eruption. However, most of the damage and casualties were attributed to heavy tephra falls that reached 20-30 cm thickness. In Nglegok (~55 km SW of the volcano) residents reported falls of fist-sized tephra, with some material that was head-sized. About 15 cm of ash accumulated at Blitar, ~25 km SW of the summit. Ashfalls were also reported from Malang, ~35 km E of Kelut. The weight of the tephra caused houses to collapse, trapping their occupants. As of 20 February, the official death toll had risen to 32, with >500 homes and 50 schools destroyed and many others damaged. Tracking of the plume by satellite was made difficult by heavy weather cloud activity in the area. Imagery from Japan's GMS satellite at 1300 showed a bright cloud 53 km across centered over the volcano. At 1347, a NOAA polar orbiter image revealed that the plume, still roughly circular and centered over the volcano, had grown to ~160 km in diameter. Preliminary temperature analysis suggested that the top of the dense cloud was at ~12 km altitude, although diffuse material could have extended higher. By 1600, GMS data indicated that the plume had drifted slightly WSW and was ~310 km long. Very diffuse-appearing material could be seen extending to the NW coast of Australia, ~1,400 km from Kelut, on a NOAA polar orbiter image the next day at 1347. Dispersed remnants of the plume could be traced on GMS images until 1900. Small explosions with associated glow and/or lightning were continuing during the night of 11-12 February, accompanied by strong seismic activity. A second strong explosive episode occurred between 1512 and 1827 on 12 February. Incandescent tephra rose 7 km above the crater. Rains triggered a major lahar on 15 February that moved downslope at 40-60 km/hour, inundating parts of subdistricts ~16 km NNW (Kepung) and 17 and 28 km NW (Ploso Klaten and Guran) of the summit, forcing residents to flee to high ground. Further heavy rains during the night of 16-17 February forced 50,000 Kepung subdistrict residents to flee. Minor eruptive activity for ~2 hours that night sent thick ash clouds to ~600 m above the vent. Additional lahars the next day moved downslope at ~45 km/hour, destroying hundreds of hectares of agricultural land. Further Reference. Sudradjat, Adjat, 1991, A preliminary account of the 1990 eruption of the Kelut volcano: Geol. Jahrbuch, v. A127, p. 447-462. Information Contacts: VSI; Y. Sawada, JMA; O. Karst, SAB; U.S. Embassy, Jakarta; T. Casadevall, USGS; Jakarta Post; UPI. The following is from Patrick Allard. "Joint investigations . . . were conducted by volcanologists from VSI, the French CNRS, and Paris Univ on 19 July, 25 August, and 2 September. 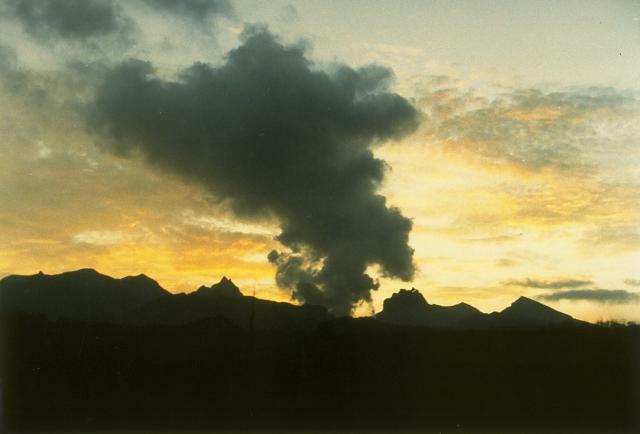 Many months after the 10-12 February explosive eruption, intense activity was persisting. "The topography of the crater (figure 1) was deeply modified by the eruption. The former crater lake (~2 x 106 m3), blasted out during the initial eruptive phase, has been replaced by a pit crater ~450 x 500 m wide and 100 m deep. The walls of the pit are very steep and unstable, leading to frequent landslides. A lake of muddy water (85°C), 150 x 160 m, occupies its SE floor. Strong, loud emission of steam and gas (193°C, ~14 bars pressure for a steam-saturated reservoir) continuously occurs from two blowing vents N of the lake, contributing much of the plume that rises a few hundred meters above the crater rim. Gas samples were taken from these vents 19 July. Figure 1. Sketch of Kelut's crater showing main sites of gas emission, August-September 1990. Courtesy of Patrick Allard. "Thick tephra layers from the February eruption have accumulated in the remaining parts of the crater, dipping with a gentle slope toward the inner pit. These layers are cut by arcuate fractures, more or less concentric to the pit walls, as well as by smaller radial fissures, which probably result from both compaction and sliding of the recent deposits. Some arcuate fractures are >1 m wide and 20 m deep. During our August visit it was discovered that high-temperature gases (>500°C, and up to 850°C at 1 m depth) escape from many of these, red glow being visible in the daylight at some sites. Gas plumes, varying in color from white to blue, mark the active vents, and the fractures and rims are blanketed with abundant sublimates. While some fractures are extinct, others are very recent, since their opening projected blocks and lapilli above the upper mud layer that formed during the rainy season (February-June). The release of high-temperature gases through these fractures may reflect either late (passive) degassing of cooling pyroclastic deposits from the February eruption or active degassing of a shallow magma body (residual intrusion?). Analysis of both stable and radioactive components in gas and aerosol samples collected at different sites may provide some geochemical insight into this question, as well as into the possibility of further phreatic or even phreato-magmatic events. "Rainfall over the volcano averages 5-7 x 106 m3/year, so the crater lake could re-form during the next year or more, depending on the rate of heat output. The explosive blast of the crater lake and consequent lahar formation were responsible for most casualties from the past Kelut eruptions in 1919 (5,160 casualties), 1951 (7), and 1966 (210), even though this hazard was successfully mitigated by VSI during the 1990 eruption." *Both VSI's estimate of tephra volume (>100 x 106 m3) and measurements of eruption cloud height meet the criteria of Newhall and Self (1982) for a VEI of 4. Preliminary temperature analysis from satellite images suggested that the top of the dense portion of the plume was at ~12 km altitude (15:01), but lidar data from the RV Akademik Korolev detected layers above 20 km altitude, well into the stratosphere, in the central and western Pacific shortly after the eruption [and the SAGE II instrument detected aerosols to 25 km] (see Atmospheric Effects, GVNB 15:08 and 15:12]). Reference. Newhall, C.G., and Self, S., 1982, The Volcanic Explosivity Index (VEI): an estimate of explosive magnitude for historical volcanism: JGR (Oceans and Atmospheres), v. 87, no. C2, p. 1231-1238. Information Contacts: VSI; P. Allard, G. Polian, and J-C. Sabroux, CNRS, France; A. Jambon and B. Marty, Univ Paris, France. The press reported on 26 November that four people had recently been killed by lahars that overflowed a river channel in the Blitar region (~30 km S of the summit). During March fieldwork, gas was emitted from numerous fissures within and around the small light-green pool in the SE part of the former crater lake (15:09). The small hummocky area in the center of the former lake bed expelled hot gases (temperatures between 200 and 240°C, up from ~190°C in late 1990) under high pressure with a jet aircraft sound and very strong sulfurous odor. Workers continued to quarry the still-hot (90-400°C) pyroclastic-flow deposits (~25 m thick) that buried the mouth of the Ampera Tunnel, in the SW side of the crater. The average daily rainfall in March was 46 mm, and lahars were reported in the Ngobo (WNW flank) and Sumberagung (W flank) rivers. The latter river overflowed in the town of the same name (7 km W of the crater), but no victims or significant damages were reported. An average of two tectonic earthquakes (but no volcanic earthquakes) were recorded daily. Increasing crater lake temperature, water level, and inflation have been observed since 19 January 2001. Water temperature in the crater lake rose to 47.5-49.1°C. On 21 January water level rose 5 cm. Leveling measurement showed 5.5-6 mm of inflation. During 16-22 January, seismographs recorded 20 tectonic earthquake events. These observations prompted the VSI to increase Kelut's hazard status from 1 to 2 (on a scale of 1-4). Monitoring of Kelut's crater lake indicated a relative increase of water temperature, a rise in surface level, and a decrease in pH into late February 2001. The Volcanological Survey of Indonesia (VSI) released new information revealing that temperatures actually began to rise as of 8 January 2001, rather than on 19 February as disclosed in a previous report (BGVN 25:12). The lake reached a maximum temperature of 51.2°C on 30 January (table 1). Table 1. Crater lake temperatures during 8 January-26 February 2001 and pH during November 2000-February 2001. The maximum temperature increase was 12.7°C, while the overall increase for the period was 9.3°C. In contrast, pH decreased. Courtesy of VSI. A 60-cm increase in lake water level was observed as of 19 January relative to the height at an undisclosed earlier date. Workers measured pH values of the crater lake water and detected a significant overall decrease in pH, or an increase in acidity (table 1). VSI maintained a hazard status of 2 (on a scale of 1-4) since 19 January 2001. During 6 March-9 April 2001 at Kelut, the temperature of the crater lake decreased from 50 to 48°C. Tectonic earthquakes were recorded during mid-March 2001, with two occurring per week during 12-23 March. Visual and instrumental observations showed no significant changes. Kelut remained at Alert Level 2 (on a scale of 1-4). No further reports were issued through at least May 2003. According to Alain Bernard, the lava dome that extruded in late 2007 (BGVN 33:03) continued to increase in size until it covered much of the crater lake and it rose to overwhelm the drainage inlets. Bernard noted that dome growth had seemingly ceased by April 2008. Around that time (but at unstated date), VSI made initial estimates of the dome's dimensions as 200 m high, 400 m wide, with a volume of 35 x 106 m3. On 12 May 2008, the eruption status was downgraded to Green, a level indicating that either no significant eruption is expected or that fewer than 100,000 people within 100 km of the volcano would be affected by activity. Information Contacts: Alain Bernard, Free University of Brussels, CP 160/02, 50, avenue F, Roosevelt, 1050 Brussels, Belgium (URL: http://www.ulb.ac.be/sciences/cvl/); Volcanological Survey of Indonesia, Center of Volcanology and Geological Hazard Mitigation, Saut Simatupang, 57, Bandung 40122, Indonesia (URL: http://vsi.esdm.go.id/). A memorable eruption at Kelut began in August 2007 injecting what became a substantial lava dome in the midst of a crater lake. The process was devoid of large violent steam explosions of the kind often associated with molten lava extruding into a lake. The passively emplaced lava dome evaporated and displaced most or all of the crater lake. Dome extrusion had clearly stopped by April 2008 (BGVN 33:07) or perhaps by May 2008 (De Bélizal and others, 2012). Since then and as late as April 2012, the Center of Volcanology and Geological Hazard Mitigation (CVGHM), has noted ongoing quiet, at times broken by the emergence of diffuse white plumes. Those plume were seen in June 2009 rising 50-150 m above the crater and the new dome was still emitting steam in February 2012. As of 30 March 2012, the Alert Level remained Green, although CVGHM recommended that people not approach the lava dome due to instability of the area and the presence of potentially high temperatures and poisonous gases. Three short subsections follow. The first discusses uplift at Kelut during 2007-2008 as part of a larger survey of volcanic deformation on Java (Philibosian and Simons, 2011). The next subsection discusses a paper that provides an overview on the unexpectedly tranquil eruption, which, though of substantial size, was one of Kelut's few substantial yet passive eruptions in the historic record (De Bélizal and others, 2012). The authors surveyed residents to assess how they felt about how authorities had managed the crisis. The third subsection below discusses the dome's declining thermal output in early 2008, and presents a photo taken in February 2011 showing the steaming dome's spiny upper surface. 2007-2008 deformation. Philibosian and Simons (2011) discussed satellite-borne (Japanese ALOS) L-band synthetic aperture radar used to conduct a comprehensive survey of volcanic deformation on Java during 2007-2008. For Kelut, the authors found a possible 15 cm line-of-sight change in late 2008, an uplift. The area of uplift was limited to the very top of Kelut and was only a few hundred meters wide. However, the authors state that, given there were only two radar acquisitions after this late 2008 uplift, it was "difficult to judge whether this was permanent, real deformation rather than a short-term atmospheric effect." According to the authors, "the volcano did not exhibit a significant deformation before or during the dome extrusion in our time series" (figure 13). Figure 13. Time series of Kelut's deformation during October 2006-January 2009 (summing all the time steps and for satellite track 428). The plot shows the 15-cm line-of-sight change consistent with an uplift peaking during late 2008. The period of observed lava dome extrusion (shown in red) corresponded with a minor uplift (under 5 cm along the line of sight). Taken from Philibosian and Simons (2011). 2007 eruption and crisis management revisited. De Bélizal and others (2012) discuss a survey conducted shortly after the end of an evacuation process triggered by Kelut's eruption that started in 2007. The authors summarized Kelut's unrest that started prior to the extrusions first seen in August by noting that earlier, on 1 November 2007, CVGHM recorded a new peak of seismicity with signals having reached shallow depths beneath the crater floor. The crater lake temperature recorded by a thermal camera increased significantly by 6 November. A steam plume developed, reaching 550 m above the crater lake. A new lava dome extruded through the ~350 m diameter crater lake (BGVN 33:03). Progressively, nearly all the lake water vaporized as the lava dome grew to a diameter of 400 m and a height of 260 m representing a volume of ~35 x 106 m3. According to De Bélizal and others (2012), "recorded volcanic seismicity decreased shortly after the onset of dome growth. Tiltmeter records also showed the absence of any significant deformation on the flanks of the volcano. These data suggested that the magmatic pressure decreased within the volcano therefore greatly reducing the likelihood of a violent explosion. Thus, on 8 November 2007, Indonesian authorities decided to end the emergency phase. The volcano Alert Level was lowered to Level 3 'Siaga' until 30 November, when it was then lowered to Level 2 'Waspada' until August 2008." The passively extrusive and unexpectedly non-explosive eruption was the first here in recent historical times. This called for careful monitoring of both the eruptive behavior of the volcano and the stability of a lake-bound dome plugging the vent. Tourism and agriculture ceased on its flanks for many months in anticipation of potential sudden signs of renewed activity. The article stated that the crisis management team ordered an evacuation, which followed the rise to Alert Level 4 on 16 October 2007 (BGVN 33:03), but it noted that many residents disregarded the order because they did not consider that an eruption was imminent. The authors conducted interviews with members of the crisis management team, and undertook a questionnaire-based survey in the settlement nearest to the crater to determine how residents reacted to the crisis and how they thought authorities managed the crisis. The survey was carried out while Kelut was still under surveillance for fear of an explosive phase. According to the authors, the crisis management team "was well organized and strategic"; however, the results "showed that crisis management was not fully integrated with the way of life of the local communities at risk, and that information, communication and trust were lacking." Decreasing thermal alerts in 2008 and an early 2011 photo. During November and December 2007, there were numerous days with MODVOLC thermal alerts. This number decreased in January 2008 to only six days that month. After January 2008, thermal alerts had been absent as late as 27 April 2012. The probable cause was the cooling of the dome to the point where the levels of thermal radiation emitted dropped below the threshold values needed to create MODVOLC alerts. A photo of Kelut taken by Daniel Quinn in early 2011 shows the steaming, rough-surfaced lava dome in the crater (figure 14). The photo only showed a small portion of the entire crater floor, but on the N side of the dome, the crater floor contained a dark brown, muddy-colored patch of water the photographer considered a large puddle. Some 2010 photos on the Picassa website showed a small body of water on the crater floor at that time. Figure 14. A late January or early February 2011 photo taken of Kelut's new dome from a high spot on the NNW rim. Apparent are both the dome's spiny upper surface, and many areas of the dome still emitting small amounts of steam. The photo appeared on the Picassa website and is used with the permission of the photographer, Daniel Quinn. According to Daniel Quinn, the photo in figure 14 was taken on the rim at a spot accessed via a small pavilion he passed walking from the car parking area. He took the photo having walked clockwise about as far around the rim as he could travel before reaching vertical cliffs. Pungent odors were absent during his visit. References. De Bélizal, É., Lavigne, F., Gaillard, J., Grancher, D., Pratomo, I., and Komorowski, J. , 2012. The 2007 eruption of Kelut volcano (East Java, Indonesia): Phenomenology, crisis management and social response, Geomorphology, v. 136, issue 1, p. 165-175. Philibosian, B., and Simons, M., 2011. A survey of volcanic deformation on Java using ALOS PALSAR interferometric time series, Geochemistry Geophysics Geosystems, v. 12, no. 11, 8 November 2011, Q11004, 20 pp. (DOI:10.1029/2011GC003775). Information Contacts: Center of Volcanology and Geological Hazard Mitigation (CVGHM), Jalan Diponegoro 57, Bandung 40122, Indonesia (URL: http://vsi.esdm.go.id/); Daniel P. Quinn (URL: http://bubbingtondump.com/). The relatively inconspicuous, 1731-m-high Kelut stratovolcano contains a summit crater lake that has been the source of some of Indonesia's most deadly eruptions. A cluster of summit lava domes cut by numerous craters has given the summit a very irregular profile. Satellitic cones and lava domes are also located low on the eastern, western, and SSW flanks. Eruptive activity has in general migrated in a clockwise direction around the summit vent complex. More than 30 eruptions have been recorded from Gunung Kelut since 1000 CE. The ejection of water from the crater lake during the typically short but violent eruptions has created pyroclastic flows and lahars that have caused widespread fatalities and destruction. After more than 5000 people were killed during an eruption in 1919, an ambitious engineering project sought to drain the crater lake. 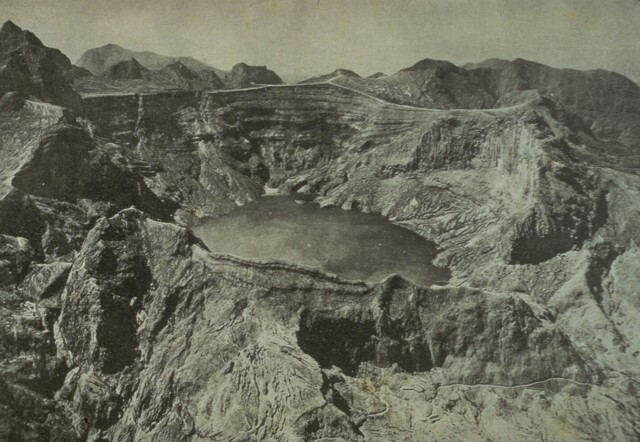 This initial effort lowered the lake by more than 50 m, but the 1951 eruption deepened the crater by 70 m, leaving 50 million cubic meters of water after repair of the damaged drainage tunnels. After more than 200 deaths in the 1966 eruption, a new deeper tunnel was constructed, and the lake's volume before the 1990 eruption was only about 1 million cubic meters. Alzwar M, 1985. Gunung Kelut. Bull Volc Surv Indonesia, 108: 1-60 (in Indonesian). Bourdier J-L, Pratomo I, Thouret J-C, Boudon G, Vincent P M, 1997. Observations, stratigraphy and eruptive processes of the 1990 eruption of Kelut volcano, Indonesia. J. Volcanol. Geotherm. Res., 79: 181-203. Lesage P, Surono, 1995. Seismic precursors of the February 10, 1990 eruption of Kelut volcano, Java. J. Volcanol. Geotherm. Res., 65: 135-146. Stehn C E, 1929. Keloet. 4th Pacific Sci Cong Java, Excur 2A, p 3-23. Thouret J-C, Abdurachman K E, Bourdier J-L, Bronto S, 1998. Origin, characteristics, and behavior of lahars following the 1990 eruption of Kelud volcano, eastern Java (Indonesia). Bull Volcanol, 59: 460-480. Wirakusumah A D, 1991. Some studies of volcanology, petrology and structure of Mt. Kelut, East Java, Indonesia. Unpublished PhD thesis, Victoria Univ of Wellington, 460 p.
Zaennudin A, Dana I N, Wahyudin D, 1992. Geologic map of Kelut volcano, East Java. Volc Surv Indonesia, 1:50,000 geol map. There is data available for 41 Holocene eruptive periods. There is no Deformation History data available for Kelut. This August 1922 photo from the NW shows the still vegetation-free summit of Kelut volcano following the powerful May 1919 eruption and the relatively mild December 1920 eruption. The 1919 eruption, Kelut's largest in historical time, produced devastating pyroclastic flows and lahars that killed over 5000 people. This prompted an engineering project, completed in 1926, to construct tunnels to lower the level of the crater lake. A much milder explosive eruption in 1920 was accompanied by extrusion beneath the crater lake of a small lava dome. Kelut volcano has been notorious for the repeated ejection of crater-lake water during eruptions, producing devastating lahars. A series of tunnels and shafts were constructed in the 1920's to lower the lake level and reduce the hazards of eruptions. The initial tunnels lowered the lake level 50 m, but the 1951 eruption deepened the crater by 70 m, leaving 50 million cu m of water. Following another devastating eruption in 1966, lower outlet tunnels were constructed, and prior to the 1990 eruption the lake contained only 1 million cu m of water. Photo by John Dvorak, 1980 (U.S. Geological Survey). Gunung Sumbing is one of several prominent lava domes at the summit of Kelut volcano in central Java that give the low volcano an irregular profile. 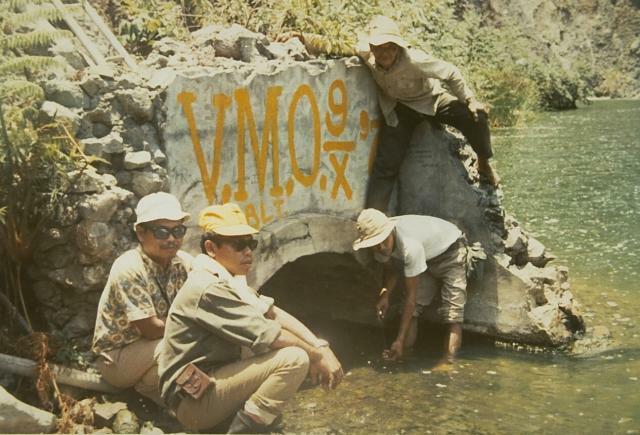 Volcanological Survey of Indonesia scientists measure water levels at a drainage tunnel of Kelut crater lake in 1973. A series of drainage tunnels and shafts were constructed following the devastating eruption of 1919, in which 5110 people were killed, to decrease the amount of water in the summit crater lake. 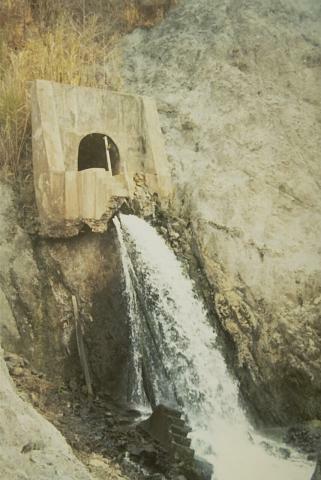 Loss of life from devastating lahars produced by the explosive ejection of crater lake water has been significantly reduced in subsequent eruptions, although a new tunnel needed to be installed after a 1951 eruption deepened the crater by 70 m.
Outlet tunnel of Kelut crater lake drainage system in 1973. A series of drainage tunnels and shafts were constructed following the devastating eruption of 1919, in which 5110 people were killed, to decrease the amount of water in the summit crater lake. Loss of life from devastating lahars produced by the explosive ejection of crater lake water has been significantly reduced in subsequent eruptions. The original outlet was lowered to this level following the deepening of the crater by an eruption in 1951. 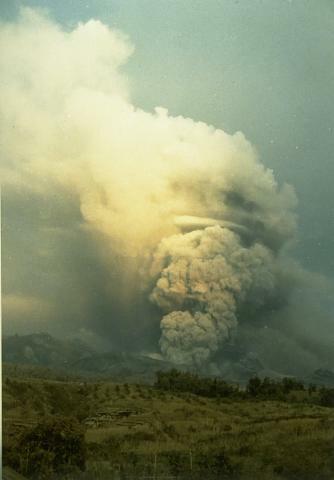 Explosive eruption of Kelut in February 1990 seen from the Volcanological Survey of Indonesia observation post on the west side of the volcano. This eruption emptied the crater lake and produced pyroclastic flows that traveled 7-8 km. A series of lava domes gives the summit of Kelut a broad, irregular profile. An ash column rises above a pyroclastic flow descending a west side valley of Kelut volcano in February 1990. During the eruption, which began on February 10 and lasted until the night of February 16-17, pyroclastic flows traveled 7-8 km from the volcano and lahars destroyed much agricultural land. 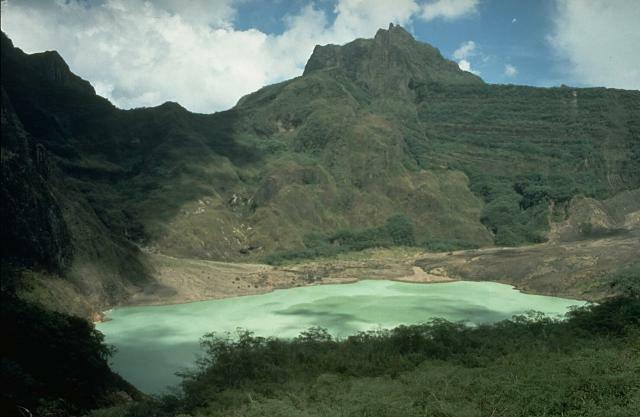 The broad, irregular summit of Kelut volcano contains several lava domes such as Gunung Kelut in the center of the photo, and a crater lake that has been the source of frequent violent eruptions that have caused much devastation. Construction of outlet tunnels following an eruption in 1919 in which 5110 people were killed has reduced the number of fatalities from pyroclastic flows and lahars during subsequent eruptions. Photo by Dan Dzurisin, 1980 (U.S. Geological Survey). During the devastating April 1966 eruption, pyroclastic flows swept up to 9 km from the summit crater. These trees were blown down parallel to the travel direction of the pyroclastic flows near Bambingan, 5 km west of the crater. This May 18, 1966 photo shows Umbuk hill in the background and was taken about three weeks after the brief April 26-27 eruption, which lasted only about 7 hours. 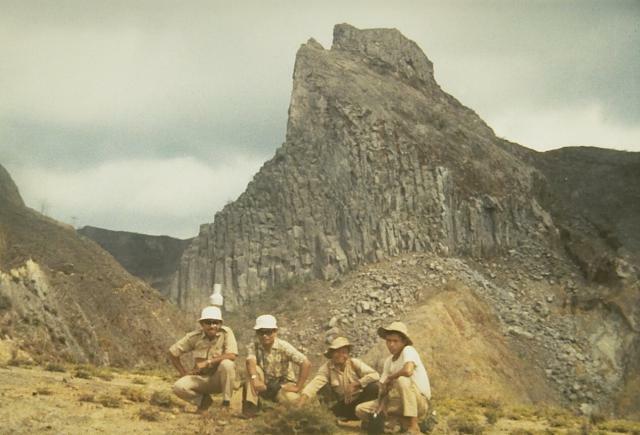 Photo by I. Suryo, 1966 (Volcanological Survey of Indonesia). Steam rises from the surface of a hot secondary lahar in the Temas river, on May 19, 1966, three weeks after a devastating eruption on April 26-27. During the eruption lahars swept up to 31 km down the Termas river on the SW side of the volcano. The Termas river lahars were part of the main flow, which originated in the Badak river channel below the SW-side low point of the crater rim. Primary lahars caused most of the more than 200 fatalities from the eruption, but three people were also killed by secondary lahars such as the one seen in this photo. 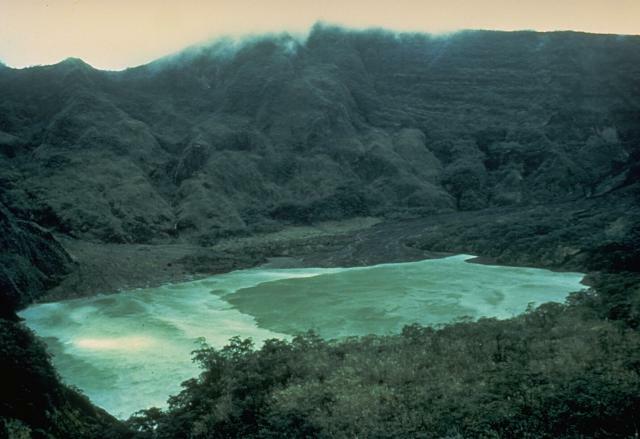 The empty, vegetation-free crater of Kelut volcano is seen here from the SW-side overflow on May 20, 1966, less than a month after a devastating eruption. A brief, but powerful explosive eruption April 26-27 produced pyroclastic flows that swept 9 km from the summit and deadly lahars that reached up to about 30 km along river drainages on the south-NW sides. As with many other Kelut eruptions, it occurred without premonitory activity. No signs of an impending eruption were noted during a visit to the summit crater only two days earlier. Incandescent blocks from the growing lava dome at Kelut volcano in November 2007 form traces extending into the crater lake (lower left) in this view from the west. Increases in water temperature and color were noted beginning on September 11, 2007. On November 4 a black lava dome was seen rising above the lake surface and reached a visible radius of 250 m and a height of 120 m by November 8. Dome growth had apparently ceased by April 2008, by which time it had filled much of the crater lake. Copyrighted photo by Tom Pfeiffer, 2007. There are no samples for Kelut in the Smithsonian's NMNH Department of Mineral Sciences Rock and Ore collection. Large Eruptions of Kelut Information about large Quaternary eruptions (VEI >= 4) is cataloged in the Large Magnitude Explosive Volcanic Eruptions (LaMEVE) database of the Volcano Global Risk Identification and Analysis Project (VOGRIPA).